Eternity is a long time. I can only imagine Tommy’s Joy! 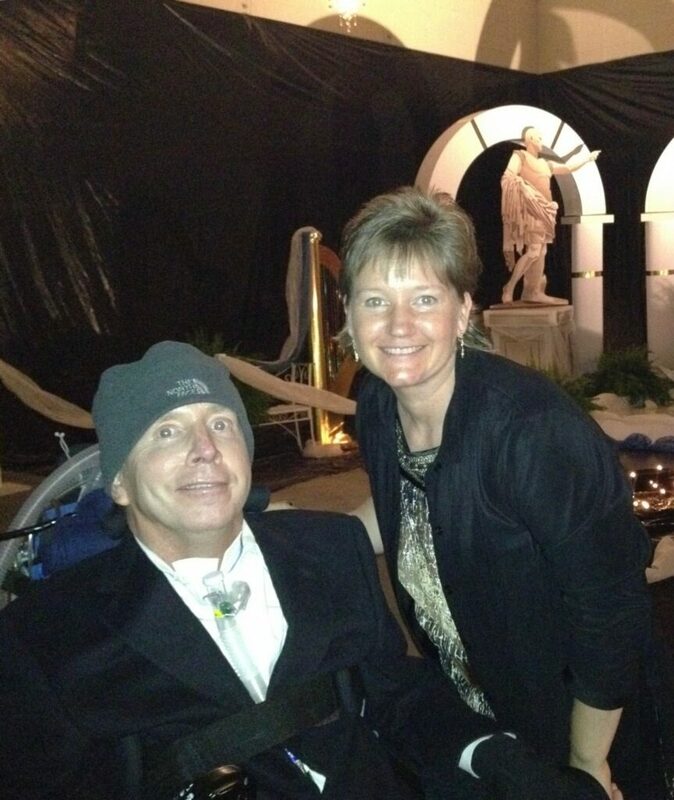 For now, though, Tommy is confined—yet content—to be rolling through this life in a wheelchair. His world was flipped upside down after falling from a ladder in 2009, and the accident left him paralyzed. I have been one of his caregivers for the last nine years. Knowing Tommy and his wife, Robyn, has changed my life. They have welcomed me into their family and have loved me well. Because of their firm foundation of faith, I have seen firsthand the sustaining power of the Holy Spirit. Before he was forced to slow down, Tommy admits there were many people and opportunities he missed because he was running so fast through life. Thank goodness he didn’t run by Robyn and miss the blessing she has been to his life. Having to roll through life has opened doors for them to share their faith and encourage people that even after a great loss there is still a divine purpose. Life is not easy for any of us, and it is definitely not easy for Tommy and Robyn. Their positive outlook is only possible because they are looking through the lens of faith. Through this tragedy, their trust in God has remained solid and is evident by their steadfast love for one another. Adjusting to their new “normal” life still presents challenges day by day, yet their lives are a testament to the miraculous power of hope. If you find yourself facing a mountain that looks too high to climb, remember you are not alone. And even when life seems like it is too much to bear, take a breath and remember you are loved, and that you are alive. Your Heavenly Father who knows you and loves you will lead you through the troubles of this life. There is a glorious and timeless place called eternity where you too can run on streets of gold with Tommy and me one day. Great message April!! Tommy was pretty slow before the accident so I am sure you will be able to catch him! You should know about Tommy, you were there from the beginning taking him places. We are so grateful for your friendship! Loved reading this blog April! Thank you for your testimonial and for being Tommy and Robyn’s friend as well as Tommy’s caregiver. They are blessed to have you in their family and I know you have been blessed by your relationship with them. My prayer is that others are reading this and will be blessed by these encouraging words. To God be the glory! Thank you Ann for reading and commenting on April’s blog, she is such an encouraging person, we are very grateful for her and you!